Now is not the right moment for D.C. to pursue statehood. After a sadly short spring break, I already miss my home city, Washington, D.C. As much as I love Chicago, I miss my friends in D.C., I miss being able to see the cherry blossoms, and I even miss the often gross, overly humid air. So out of either nostalgia or homesickness, or maybe not wanting to write about Trump anymore, I’m going to be writing about D.C., specifically about why I believe it should not become a state—at least for now. On November 8, D.C. overwhelmingly voted in favor of petitioning Congress to become the 51st state of the Union. Proponents of the measure say that as taxpaying Americans, they want equal representation in Congress and Senate, like any other state. 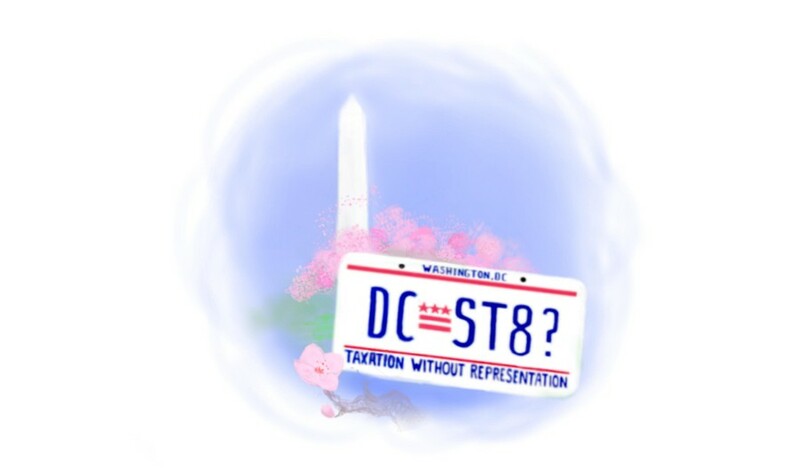 As someone driving around D.C. with a license plate that says “No Taxation Without Representation,” I’m aware of the irony in having a taxpaying population not fully represented within a country that was founded partially on the notion of representation. It’s simply absurd. However, in the current political landscape, D.C. statehood is not going to happen, especially in a Republican-controlled government that continuously strives to thwart D.C.’s liberal agenda. With Hillary Clinton winning over 90 percent of the vote in D.C., it remains a liberal stronghold that Republicans will continue to look down on. If D.C. were to become a state, it would add more liberal representation in Congress and the Senate, something that Republicans would be vehemently against. But, beyond the complete unlikelihood that D.C. will actually have a chance to become a state, there are still other issues. Most importantly, D.C. is home to all three branches of federal government, creating a conflict of jurisdiction. The Constitution actually mandates that the country’s capital cannot be a state, a fact that James Madison defends in his Federalist Papers: “a dependence of the members of the general government on the State…might bring on the national councils an imputation of awe or influence, equally dishonorable to the government and dissatisfactory to the other members of the Confederacy.” Though the bill to create a state attempts to rectify this problem by delineating a small federally-controlled area called “The District” that includes the White House, the Supreme Court, and several other buildings, this does not account for the undue influence that residents outside of the area have by simply physically surrounding it. In order to actually create federal regulations, the federal government should not be subservient to the laws that D.C. as a state could set. In a scenario where a progressive, activist government disagrees with a federal law, it is very possible to consider a situation in which a local population has extreme influence over an entire nation. The Independent Journal Review gives one possible scenario: “if riots like what gripped Baltimore last year swept into DC, would the city government crush them to guarantee the continuity of the nation’s business? Or would a sympathetic DC government declare it a more sensitive, local matter?” These types of questions don’t have easy answers. But if D.C. is to become a state it’s important to have an accurate picture of what a local government would look like and how that would, if at all, interact with the federal branches. Not only does the current suggested iteration of D.C. statehood not truly account for the risks of local government to federal government, but proponents of the movement also haven’t settled on a good name for the new state. New Columbia, a name first proposed in 1982, was initially chosen in a poorly announced meeting that quickly went downhill. The problem here is that the name is an homage to Christopher Columbus, who was responsible for the decimation of entire indigenous populations. History is finally catching up to Columbus, and there seems to be a societal shift moving away from praising him. As a city that prides itself on being progressive, further emphasizing Columbus is blatantly retrogressive. Lawmakers eventually decided to switch the name to the State of Washington, D.C., with D.C. being an abbreviation for Douglass Commonwealth. While I’m completely for the nod to Frederick Douglass—once a proud D.C. resident—and I wholly support the switch away from New Columbia, the name is still not quite there. It seems counterintuitive to include “Commonwealth” in the new name, since D.C. wants to become a state, and not a commonwealth, which is its own separate category. While the name is a smaller issue, it shows that if D.C. can’t even choose a proper name, then advocates haven’t really thought through all of the nuances behind this massive proposition. In the long run, I do hope to see a compromise worked out in which D.C. can become a state, but I know that now is not the right moment to expend tons of energy on it. It is unrealistic to hope for success in a Republican-controlled Congress, and the current proposal does not address the valid risks of statehood. Fred Kardos is a first-year in the College.